Fueled by God’s sustaining grace, the long road ahead will bring both difficulty and delight. We know that the depths of Christian suffering catapults the believer to heights of unspeakable glory. The deep Katrina scars that mark our soil and flesh point to the overwhelming drop-jawed glory of God. Lakeshore Baptist Church has gained encouragement and strength from the body of Christ flooding to our side as we minister to our storm ravaged community. Please do not forget about us. The past 365 days began seeing Christ glorified in the relief, recovery, and rebuilding efforts. We could not have made it this far without God turning the hearts of His people toward the gulf coast. So much more remains undone. The task before us will take years of commitment and perseverance. We need continued prayer support, a steady flow of volunteer hands, and finances to push the work forward. When the storm hit one year ago, we trusted that God was working thousands of purposes for His glory. I know now, that part of the plan of providence included thousands of people flooding into the Lakeshore area. Dozens have become close friends. One of the most precious hails from Platteville, Wisconsin. Jamie Dunbar traveled with her church back in January and then again in March. Her heart for Lakeshore led her to serve here as a summer intern through NAMB. We threw her in the fire with both feet. Before she completed the first week we had her driving a forklift, stocking shelves, directing droves of teenagers to countless jobs, answering the phone, running errands, greeting arriving teams late into the night, and doing anything Greg, James, JoEll, and I didn’t want to do. 🙂 Although she keeps a grueling schedule, vary rarely gets five minutes off, and lives in less than desirable conditions (enough to scare off most people) she has just decided to stay with us as a semester missionary at least until Christmas. At 23 and a relative new believer, she demonstrates a maturity far beyond her years. She works quietly, learns quickly, and serves tirelessly. As my chauffeur I’ve enjoyed her heart for sound theology, her great since of humor, and her taste for good food. 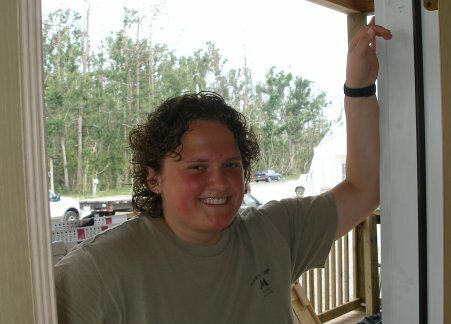 She loves the doctrines of grace, rides a cool bike, and can order a dressed shrimp po-boy like a native New Orleanian. She sings and plays guitar and couples her talent with a passion for great hymns. She even blogs. Check out her site, Because of Grace, as she chronicles her ministry in Lakeshore. I have sent e-mail to all my email friends in other states asking for donations to your distribution center, I sent them a list of items needed and for them to contact their Pastors to contact you. I also suggested that since it was hard to ship these items down here that they could possibly sent Wal-Mart gift cards to you telling what they wish for you to purchase with the cards, for example cases of can goods, paper towels, toilet paper, bottle water, etc. I and my neighbors are some of the people you have helped and it is greatly appreciated. While standing in your line waiting for the site to open we have met so many wonderful people, A church group from Kansas a couple of weeks ago,, Janet and her daughter were so sweet..
We met a elderly gentlemen yesterday that was looking for can goods and bottle water. The water supply was gone, later that evening My neighbor and me brought him 4 cases of water that we had collected for him. It made us feel good that we had something we were able to share with him. We and our community are slowly rebuilding our lives. Your church has been a ray of sunshine to us. I hope the emails will generate more help for the distribution center. Thank You again for helping our community. With the fall semester starting all over the country our summer flood of volunteer help begins to slow. Believe it or not, the usually bustling Lakeshore Baptist Church property sits almost empty and quiet this morning. My administrative assistant, JoEll, began her maternity leave today, Greg London is in Atlanta attending the FIRE conference, and James went to visit his sister in a Shreveport hospital. The one family with us this week is working off site in one of the homes. That leaves Me and Jamie (our intern) here waiting for the group of ladies from Crystal Springs to arrive some time today. So much more still remains undone. We pray that this temporary lull in volunteers will give us time to breathe and continue on for the glory of God. I’ve been trying to take this opportunity to catch up on email this morning, now that we have inter net access and air conditioning in our new office. I just set up a folding table in here to get out of our cramped office camper. We still need to paint the interior doors and trim work, complete the bathroom, and several other miscellaneous things. The outside still needs another coat of paint and the storm shutters need to be built and hung. It won’t be long before we can officially move in. Doing so should make all the efforts here more productive and efficient. 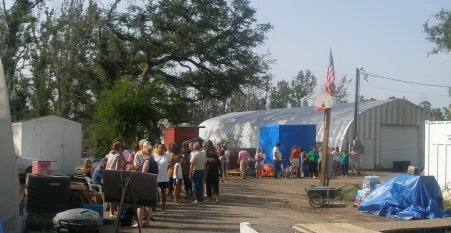 If you would like to come help, please call us at (228) 469-0110. If no one answers, please leave a message and we will return your call asap. Local kids returned to school this week outfitted by our school uniform drive. The give-away proved a great success. 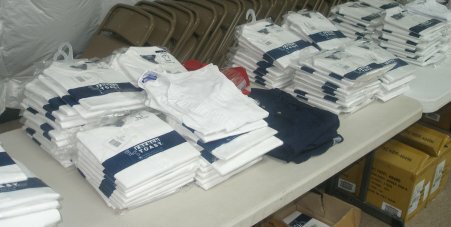 Lakeshore Baptist Church distributed over 600 uniforms to grateful parents. Things continue to happen much faster than I could ever blog about them all. A few weeks ago, Stephen Ake made his 8th trip to Lakeshore since the storm. I failed to blog about our Family Bible Conference, so please check out Stephen’s blog for a summery of God’s activity that week. He also snapped a good number of pictures from this trip. That week we hosted about 200 volunteers and saw a lot of progress being made on over a dozen homes.